The Frosmo Platform complements React environments with smooth personalization, segmentation, and experimentation capabilities for the front end. With this solution, developers can wrap the personalized or A/B testable content in a Frosmo placement component. Marketing and ecommerce teams can then set rules for personalization in the Frosmo Control Panel and bring the desired content from CMS to the website. A modern approach to headless development is to separate presentation from the content. In this fairly typical Contentful as a CMS setup, the front end is built with React and personalization features are added with the Frosmo Platform. 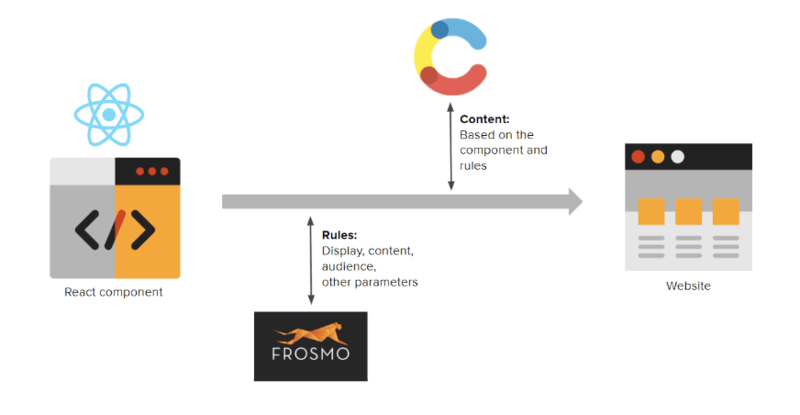 Frosmo empowers presenting dynamic content and tracking data of visitor behavior on the site. Personalization typically requires three roles: the content creator, digital marketing/optimization, and front-end developer. Their roles are illustrated below in an example where Frosmo is used as personalization software. Frosmo offers a solution for the ecommerce manager to utilize existing content made by content creators as well as templates built by front-end developers. They’re able to assign these via Frosmo’s data tracking to target specific content to different types of audiences.